I'm not even sure the last time we bought this particular flavor...and you probably know what I'm going to say about it: It's decent, but not fantastic. The cookie dough bits are alright, and the overall flavor is mild, but you still know it's vanilla. Nothing fancy, just some low cal ice cream to tide you over til tomorrow. My problem is this pit that Edy's seems to have fallen into. I really -REALLY- shouldn't have to chew my ice cream. I just want to bite the frozen goodness, but often I feel a bit like I'm chewing gum. Soft gum, but gum none the less. I guess I'm just really turned off from Edy's right now. If it wasn't for Caramel Cone Crunch, I'd be tempted to give up on them all together. It's the only one I've tried recently that I have really enjoyed. 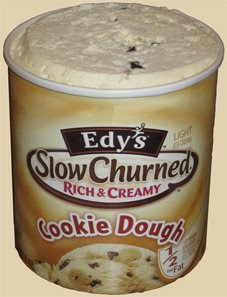 Edy's (Dreyer's) is just adding way too many chemicals and straying too far from what ice cream really should be. and yes, I'm still bitter they turned the awesome Grand Ice Cream sandwich into a fun flavor. Maybe I'm in the minority, but I kinda love the texture of Edy's. Also, their peppermint and pumpkin limited editions are my favorites so I'm super biased. But again: I like how soft it always is.